Each season's end and Christmas time brings with it many staples for an F1 fan. Autocourse. A plethora of top 10 drivers' rankings (including the one in Autocourse). And the official season review, the series that stretches all the way back to 1981. Formerly as a video but now with the onward march of progress is in the form of a DVD and Blu-Ray. And so it was that a DVD copy of 'It Was Fair' (thus continuing the series' apparent tradition of slightly curious titles), the official 2014 season review, landed on my doormat before Santa had arrived. No mean feat - in at least one previous year Santa has got there first. The long-established status of the season review series means that by now much of its content and approach are familiar. And chief among these is that in terms of its production it can hardly be faulted these days. The latest one as we've grown used to is all put together with a great deal of care and no little polish, full of varied and captivating footage from on and off the track accompanied by high-quality sound. Close-ups, on-boards and other evocative alternative camera angles are aplenty. Its narrative is authoritative and its editing sharp. Comfortably it passes the test too of providing a thorough historical record of the campaign for future reference. And this time there is plenty in there as the season review itself extends to a running time of four-and-a-quarter hours (kid ye not), making it around 40 minutes longer than last year's equivalent. As a consequence every Grand Prix weekend gets in the region of 10-15 minutes. It can hardly be said to be scrimping. Ben Edwards - who these days is an F1 season review veteran - provides the commentary once again, and as we've also come to expect is dependable, detailed and usually comprehensive in his words. Perhaps however in drafting Edwards' script there is an inevitable zero-sum game in the trade-off between providing entertainment and providing a record of the season. Edwards' commentary definitely plumps much more for the latter, and throughout - and as has been the case with Edwards and others in the role stretching back around 20 years now - he plays things consistently with a straight bat. Still I have for a while yearned a little for the witty and irreverent Clive James review commentaries of the 1980s, and even if a complete return to that isn't possible you wonder if things could be made slightly more lively and interpretative. Another zero-sum game is the consideration between appealing to the F1 aficionado and appealing to more of a mass, casual, audience. In this review, continuing what was a noticeable step when Duke returned to the fold last year after a spell away, it feels more geared to the committed F1 fan than has been the case, which speaking purely personally certainly is welcome. It might also be expected given Duke's experience and specialisation in motorsport DVDs and videos. Duke re-taking the reins also has resulted in music tracks being abandoned and in WAG and other minor celebrity reactions, thankfully, being truncated severely. But even with this overarching swing I wouldn't say either that it has gone so far as to become impenetrable to those not initiated. In another improvement on recent times the context and wider issues before and during the season are covered and often in some detail. This includes the introduction of radically revised regulations for 2014, pre-season testing as well as many of the debates and announcements after and between races throughout the year, such as the various Hamilton/Rosberg shenanigans, particularly after Monaco and after Spa, Ferrari's various behind the scenes shuffles and even some driver moves for 2015 announced later in the campaign. I can recall previous reviews and from not too long ago that concentrated almost entirely on race weekends with background issues, which even at the best of times an F1 season is big on, relegated to a slightly inchoate gathering of extras or even flushed out altogether. Another important and by now familiar feature of the review is that it contains plenty of not-seen-before footage from different camera angles and on-board shots. We're reaching the point perhaps that such is the modern saturation TV and online coverage of F1 that reserving such things for the DVD is becoming more of a challenge, so it feels not quite as big on these as before. There still is some though, and my personal favourite was Daniel Ricciardo's switch-back to out-brake his team mate Sebastian Vettel at Monza's second chicane, wherein you can hear him feathering off the throttle on the straight so to get his car to primary position on the inside. Jenson Button in Canada passing two cars in as many corners just before the race was effectively ended by a safety car appearance felt new too. But as before most of the striking not-encountered-before element of the review comes from team radio. Scattered throughout are a variety of excerpts from drivers and their pit wall occupants, many of which weren't broadcast in the TV feed during the season, to the point that you wonder why not. To the point also that these days they are becoming the review's chief unique selling point. This year's review doesn't really let us down on these, and possibly the most news-worthy among them is from, yes, Monaco qualifying and all that. Herein Lewis Hamilton upon being told of Nico Rosberg's error muttered ruefully 'ah, that was very good of him, very good', thus illustrating that suspicion between the two was well underway by this point (which we were to find out, given the pair's respective naughty moves with engine modes prior to Monaco). Indeed three rounds before in the Bahrain race Rosberg, having been cut up rather by Hamilton, shouted 'warn him that was not on!' to his engineer. Then just before the infamous Spa clash Nico shrieks in alleging that Lewis had exceeded track limits at Eau Rouge, which again may give some indication of his state of mind heading into the Les Combes incident. Once the clash has happened and Lewis has punctured, the Englishman in his inimitable style refers to Nico's actions as 'not cool'. There is plenty radio fun in there too besides the Lewis and Nico soap opera. While in the main shift from 2013 the review more than possibly any previous makes an effort to cover the sport's technical side; this harnessed to the repeated presence of Gary Anderson with his habitual authority is a welcome addition. Anderson (following a lengthy introduction to the revised power units, not by him) first contributes by in Melbourne looking at some of the, um, varied approaches to the new nose regulations. Later he adds his brief take on Nico-Lewis post Monaco quali and post Spa, as well as pops up with a few driver interviews towards the season's end. James Allen is another welcome addition, as he appears to talk though a few the season's periodic political/technical issues, such as Nico vs. Lewis post Monaco, the FRIC debate in Germany (easy to forget now isn't it?) as well as in some detail of Luca Montezemolo's later departure from Ferrari - concluding with the prophetic words 'he will never be too far away from this sport'. Jennie Gow is also there, but reduced to a slightly blink-and-you-miss-it role of introducing the Monaco weekend only with a few platitudes (the likes of which will by now be familiar to those who've followed F1, and the Principality's fun and foibles, for any length of time - there are lots of rich people on boats and they party etc, you know the drill). Copious use throughout of Will Buxton's probing interviews from the pen also is a beneficial feature. It all does a lot to add explanation and background as well as to vary the narrative and pace. Perhaps this is part of the reason why even with the review's length it rarely feels like it drags or that they were making conscious attempts to pad the thing out. Despite this however some things feel a little conspicuous by their absence. Ricciardo's disqualification from Melbourne and the subsequent unsuccessful appeal is in there though its treatment is a little light touch. As for the year's ongoing discontent about the new power units, especially about noise and particularly in the early rounds, you'd think from watching the DVD in isolation that it never actually happened, as it is not referenced even in passing. Given how wearisome it was though I don't entirely blame them on that one. The sport's financial woes which generated so much debate in the final three rounds also hardly is mentioned. Indeed literally it is only referred to in so far that Marussia and Caterham didn't turn up in Austin due to 'financial problems', and that Caterham re-appeared come Abu Dhabi with a new driver in Will Stevens. The radio clampdown in Singapore also is absent. On the flipside some of the auxiliary features that are in there might get a little wearing on repeated viewing you suspect, especially as a few are a touch on the long side, and therefore might have been better packaged off as extras, at least in their unabridged forms. The intro to the new power unit regs and Anderson's walk though the nose designs both mentioned may fall into this category, as may a section with Felipe Nasr at the start of the Brazil weekend section, which covers his move to Sauber for 2015 as well as a look at the Interlagos surface and pit entrance. A recap of the Lewis vs. Nico title battle ebb and flow prior to Abu Dhabi also bordered the unnecessary; rather like you were having your hand held. Hopefully though future reviews will retain the aim of the 2014 one but strike a better balance in terms of what they prioritise. Qualifying also doesn't get much airtime; indeed for many weekends it is not shown at all. The review reduces its presence to seismic moments such as Lewis's technical failures mid-season. Not necessarily the worst decision but certainly I wouldn't have liked to see it reduced further. Lewis fans perhaps can be grateful though as his series of Q3 errors, that for a time threatened to do so much to undermine his year, is confined in the review to his Austrian spin (as well as the commentary mentioning him having a time disallowed for exceeding track limits), as well as mention (but not showing other than on an extra) of his giving in too easily at Silverstone. 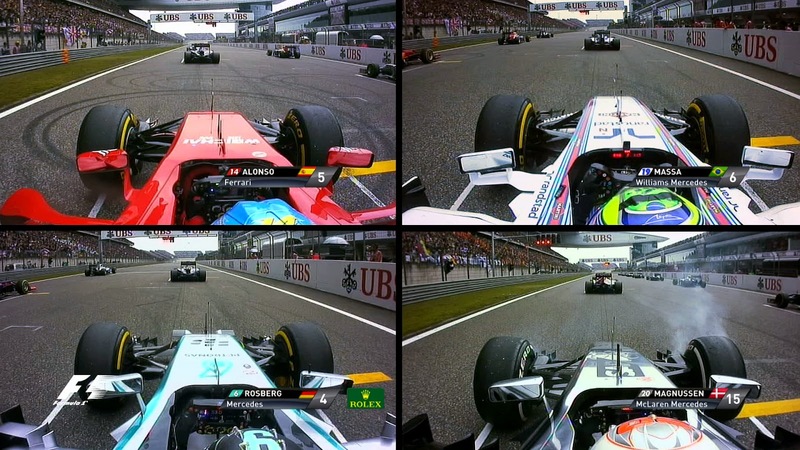 More generally in those races wherein one driver built a handy lead, such as Hamilton in Malaysia, China and Russia and Rosberg in Germany, it is common for the review to not show them at all between the run to turn one and when the chequered flag drops later - almost to the point that you'd forget they were there. Even Ricciardo in Spa hardly features once he has established control of race proceedings early on. Something like a brief 'he built an x second lead by lap y' reference would help to contextualise things. At times too the race coverage comes across as a little heavy on pit stop footage, at the expense of what happened on track. Generally however, the narrative in my view strikes a good balance between the need to follow the Merc tete-a-tete out front with showing the action that took place further back, though virtually the only time those out of the points are shown is when they provide crash action. Nevertheless some things that feel important are missed out of the final cut. Some impressive drives, such as Ricciardo coming through the field in Italy and Abu Dhabi, Bottas and Alonso doing similar at Silverstone, as well as Kimi Raikkonen's run to fourth in Spa, don't get a great deal of attention. Neither do Hamilton's pit stop delays in Austria that encouraged much debate at the time, nor Nico running off track in the same race, while Alonso's pass on Vettel around the outside of Copse at Silverstone, which was for many the pass of the year, is also nowhere to be seen. Kimi's clash with Max Chilton behind the safety car in Monaco, as well as Jean-Eric Vergne's clash with Pastor Maldonado in Bahrain - to which Vergne claimed in response that 'this guy is trying to kill me' - both of which were missed in the season's TV feed, also do not have light shed on them. Still as mentioned the review is long already and as also mentioned not all that much in it feels superfluous. Given this it is inevitable that the axe had to fall somewhere. The review also ought to be commended for the respectful and understated way that it covered the season's most harrowing moment of Jules Bianchi's accident at Suzuka, rejecting the opportunity to show graphic footage. The difference in the running time compared with last year's DVD is indeed yet more distinct, as this year's DVD on a separate disc has 42 minutes of extras made up mainly of on-board footage, bringing us up to close to five hours all-in. The 2013 DVD at least didn't contain any extras worthy of the name. This year's extras are made up of one slot from every 2014 weekend, but just when watching them through you think that it will for each be a mere on-board quali lap with driver commentary - as has been the case in at least one previous season review - it actually starts to mix things up fairly impressively. 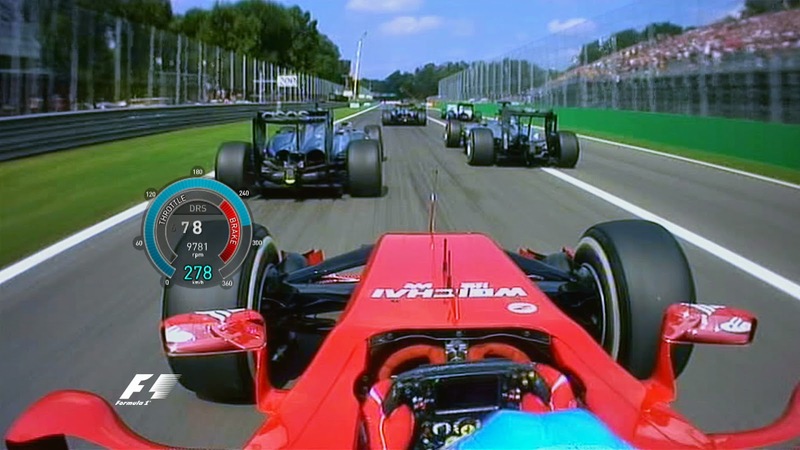 There are some split screen on-boards of several drivers simultaneously at first corner clashes and the like. Many of the selections are compellingly out of the box too, such as Vergne in the final two laps at Singapore gobbling up the track and several opponents to claim sixth place even after a penalty of five seconds was added. 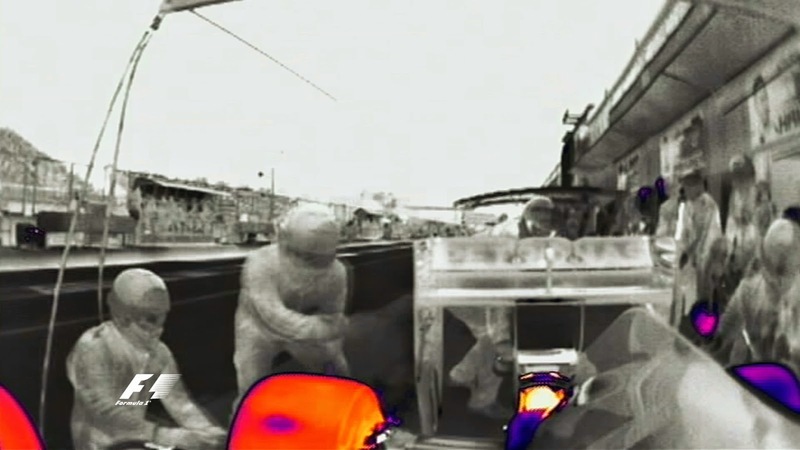 Gary Anderson in Canada's race talking through Lewis Hamilton's rear brake failure via a rear-view thermal-image camera is the best of the bunch. Listen out too for Maldonado's Renault unit sounding like a bag of nails in Malaysia. A couple of the selections however - Rosberg's qualifying lap in Melbourne that was only good enough for P3 as well as Alonso's first lap in Monza - seem slightly odd choices. But still, I'd strongly recommend this review DVD and not just to the collectors out there. As mentioned, an established series that now is 33 years old isn't going to be big on departures or surprises, but it cannot be denied that it does its fundamental job very well. With close to five hours of footage it's pretty good bang for your buck also, while in addition for the committed F1 fan there are plenty of steps in the right direction in this year's review. The Official Review of the 2014 FIA Formula One World Championship DVD or Blu-Ray can be brought direct from Duke via this link: http://www.dukevideo.com/f12014. If you're buying the season review DVD or Blu-Ray from Duke, or anything else from Duke for that matter, don't forget to use the 'TalkF1' promotional code to get 20% off the price. Simply enter the 'TalkF1' code at the checkout to get your 20% discount. It's an offer especially for Talking about F1 readers on all Duke Products. If you go onto www.dukevideo.com you'll see all sorts of DVDs, Blu-Ray discs, downloads etc for the motorsport fan. Nice write up on this years review. I have been a fan of these for years and actually was happy with Clive James doing the witty narative. They have improved hand over fist and are always a great Xmas present....i am still waiting for mine. Thanks very much - hope the review's turned up! Thanks very much Pawel, much appreciated.